A handsome, small tree with thick green leaves and good red-orange fall color. The persistent samaras are brilliant red. 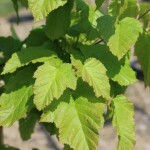 A good tree for dry, alkaline soils and cold winters. Great small garden or street tree.